If your family and friends aren't NurseGrid users, you can share your schedule with them through third party apps! 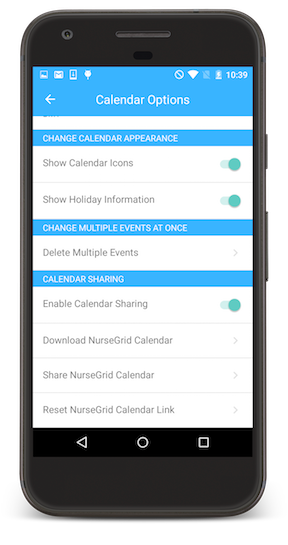 Then, tap "Share NurseGrid Calendar" on the Calendar Options screen. From there, you'll be able to select the method you'd like to use to send your schedule to your friends and family – just choose whether you'd like to send it via email, text message, or Facebook. The URL will be pasted into a new message or post and you can send it to whoever you'd like to share your calendar with. The recipient will need to go to Google Calendar, click the dropdown arrow next to "Other calendars" on the left side of the screen, and then select "Add by URL." Once the unique calendar URL is pasted here, click "Add Calendar." Your NurseGrid schedule should then be synced with your friend or family member's Google Calendar! Please note that it may take up to 12 hours for schedules to fully sync with third-party calendars.